Justin Urquhart Stewart, Co-founder and Head of Corporate Development at Seven Investment Management (7IM), explains the many retirement risks investors cannot afford to be blindsided by – including the very real chance that they could outlive their savings. Another Christmas has been and gone and, while the surfeit of turkey, mince pies and chocolates may have left you wanting something slimming, the desire not to be able to enjoy some luxuries in life may not even last until the end of January. The reality, however, is that for those who haven’t planned their retirement finances properly, the days of decadence may well be over for quite a lot more time than a month – and long before you’ve pulled the proverbial cracker. 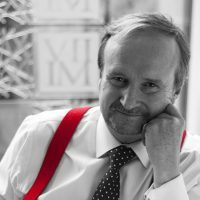 Even those that have thought things through before may not realise all the implications that pension freedoms have had on their retirement planning. The reality, however, is that for those who haven’t planned their retirement finances properly, the days of decadence may well be over for quite a lot more time than a month – and long before you’ve pulled the proverbial cracker. For decades, a traditional strategy that many investors have adopted – and in particular for their pension pots – has been an approach that reduces the level of investment risk that they take as they get nearer and nearer the day they retire. Known as the “lifestyle” approach, the mix of investments alters as individuals reach pre-set ages. It encourages investors to invest in riskier assets at the outset of their career as they try to build up their savings. The logic goes that they should be able to “afford” that risk as they have the time for their portfolios to “recover” in the event of a big set-back in the markets, such as the one we saw in 2008. As investors get older, they then steadily shift into investments that are deemed to be less risky – stepping down the level of investment risk as they approach retirement. The shift in risk is achieved by switching from stocks and shares (aka equities or “riskier” assets) to bonds (seen as a “safe haven”) as you get older. So, you might start off with as much as 70% of your portfolio in stocks and shares and 30% in bonds, and steadily move a percentage of those equity assets into bonds as you hit those age milestones. By the time you retire, the majority of your assets would be invested in the traditional safe havens of government bonds or gilts (bonds issued by the UK government). While annuities gave us certainty as to how much we would get each year, it was important not to suffer a big investment hit just before purchase. This supported lowering the level of investment risk over time and fixed income made sense in that world. By moving largely into bonds as retirement approaches, the risk of rising annuity costs undermining your income in retirement is circumvented as any decline in interest rates (and, by implication, the income from annuities) is offset by an increase in your portfolio value. In April 2015, the pensions world changed. Investors were no longer forced to buy an annuity when they retired. There was no longer a definitive cut-off point in life where pension savings get irrevocably swapped for a secure income. And, as a result, time-horizons for the investment of retirement savings increased. Near 200-year record lows for interest rates have, in the meantime, reduced our expectations of future investment returns from bonds. This is also a key reason why annuities are currently seen to be “expensive”. The underlying asset for many of these investments and other pension products (i.e. bonds) are not providing investors with the same level of income they used to. As a result of the lower returns available, the incomes currently promised for annuities are lower. We also now live much longer than our parents did, and that longevity of life has not stopped extending. In England, life expectancy at birth for boys increased from 73.7 years in 1991 to 79.5 years in 2012. A baby boy born in England in 2012 can expect to live almost six years longer than the same new-born two decades before – so savings have to last longer. Notwithstanding the issues already mentioned, the lifestyle approach de-risks your pension pot to a specific point of time. Changes in the workplace, life expectancy and, in some cases, the law mean fewer people are working exactly to the expected retirement date their pension schemes assume. This could leave many adjusting the level of investment risk they are taking either much too early or much too late. Retirement planning is increasingly a personal responsibility and not a government one. With investors no longer forced to buy annuities, those longevity dynamics that were increasingly affecting annuity market decision-makers are now being faced by individual investors. Retirement planning is increasingly a personal responsibility and not a government one. With investors no longer forced to buy annuities, those longevity dynamics that were increasingly affecting annuity market decision-makers are now being faced by individual investors. Our savings need to work harder to beat inflation, which is making a come-back, without the support of interest rates. All-the-while, our savings are having to stretch further as we live longer. It was this combination of events that led us here at 7IM to run some research into investors’ options. We have always aimed to provide our clients with more predictable returns. We manage money in a way that – over the medium to long term – provides each of our investors with a specified range of returns that we would work to deliver so they know what their pot of money would provide. By using the historic returns and past performance as a basis for our research, we looked to delve into the decisions that investors could make. This research threw up some interesting results. We learned, for example, that actually taking more risk early on in an investor’s career didn’t actually make much of a difference. There simply wasn’t enough in the pot to build on until much later in life when – after you’d been investing a regular sum over a long period – you had more money “at stake”. However, lifestyle strategies would look to lower the risk profile of investments precisely at this very point in the build-up of your savings pot (i.e. as the retirement date and annuity conversion approaches), and when the power of compounding becomes most powerful (i.e. investment returns generate their own investment returns). Past performance is not going to provide a roadmap as to how investments will perform in the future, and investors can lose money – to the extent where those losses are actually eating into the money originally invested. However, every scenario we ran highlighted another risk: the risk that you could outlive your savings (also known as “longevity risk”). That scenario is plotted in the below chart, which forecasts the finances of an investor who saves an average of £20,000 each year between the ages of 30 and 60. The investor then retires and looks to withdraw an annual pension of £60,000 a year, expecting to do so until the age of 90. 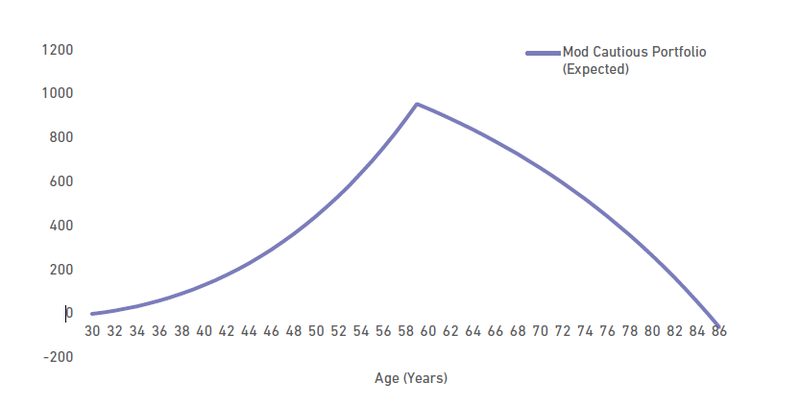 Assuming a constant growth rate, compounding annually of 4% (and in line with 7IM’s Moderately Cautious risk profile returns and a little bit built in for advisory costs) and ignoring market volatility to try and keep things simple, our simple savings model sees the money run out when the investor is nearly 86. 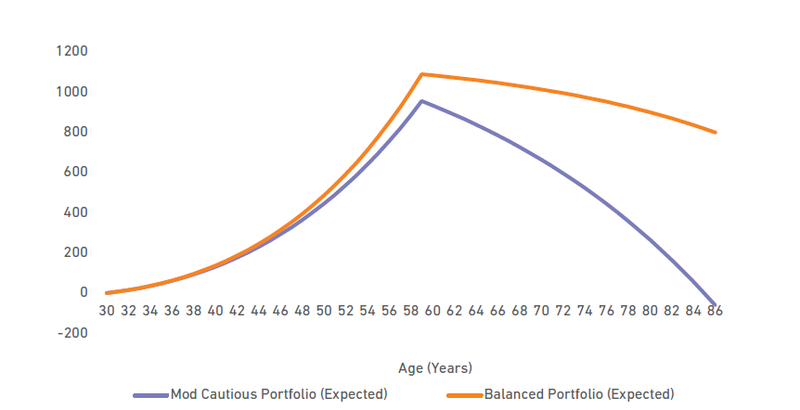 However, if the investor were to take a little more risk, and achieve a growth rate of 5%, the differences to the investors’ finances in retirement could be quite different, other risks notwithstanding – as shown by the orange line. So why has this only come now to the fore? Before, people were only living for around 20 years in retirement and so you could reasonably outlive any dwindling savings. But now you may have to double that drawdown period. And as we have highlighted here, solving this problem requires a balancing of the various sources of risk: you need to balance a combination of saving more while you’re working (savings risk), look to retire later (job risk), take a lower income in retirement (lifestyle risk) or seek a higher investment return (investment risk). Here we have to be careful – we are definitely not saying everyone needs to take more investment risk. Risk is a very personal choice. But taking some additional investment risk, while the return on bonds is so low and investment time-horizons are extending into the time of retirement itself, has the potential to reap rewards. This is especially the case when the investment pot is at its largest, which is typically just as retirement approaches. So, what are we suggesting people do? And here I have to circle back to my old adage “Don’t just plan to invest, invest in a plan”. And if you had a plan, it might be time for a new year spring clean. After all, these conversations are better done sooner rather than later if you are to be able to choose between decadence and dieting in the many years to come! If you would like to start a conversation with 7IM, please get in touch with the findaWEALTHMANAGER.com team HERE. Missed out on pensioner bonds?